Gear Up is a framework to help you to transform your idea into a high-potential venture in real time. Gear Up offers you a framework to build the critical components for business success. It will help you to determine whether a new business idea is worth your time, whether to push ahead with your current business opportunity, or toss the old plan and develop something even bigger and better. 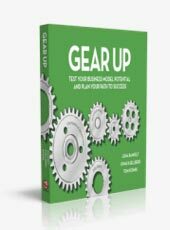 Gear Up helps you to sync the nine gears and will enable you to assess the potential in a new or existing business venture. As you follow the tried-and-tested framework you will find that there is a supporting structure to help develop a strategy unique to you, so you can create a new market or disrupt existing ones, and your path to success will emerge. The foundation for Gear Up was laid at Harvard and developed further at Stanford. Tested by executives around the world, this proven model will help you bring your best idea to life. Gear Up is a book co-authored by Lena Ramfelt, Jonas Kjellberg, and Tom Kosnik.